My Secret Recipe Club assignment this month was The Texan New Yorker. Julie was born and raised in Dallas, Texas, where she spent most of her life before moving the New York Metro Area. One of my favorite cuisines in Brooklyn is finger-licking BBQ, preferably served on metal trays lined with wax paper, ala Fette Sau. What better way to bring BBQ to my very own kitchen, than go with a Texan who knows? 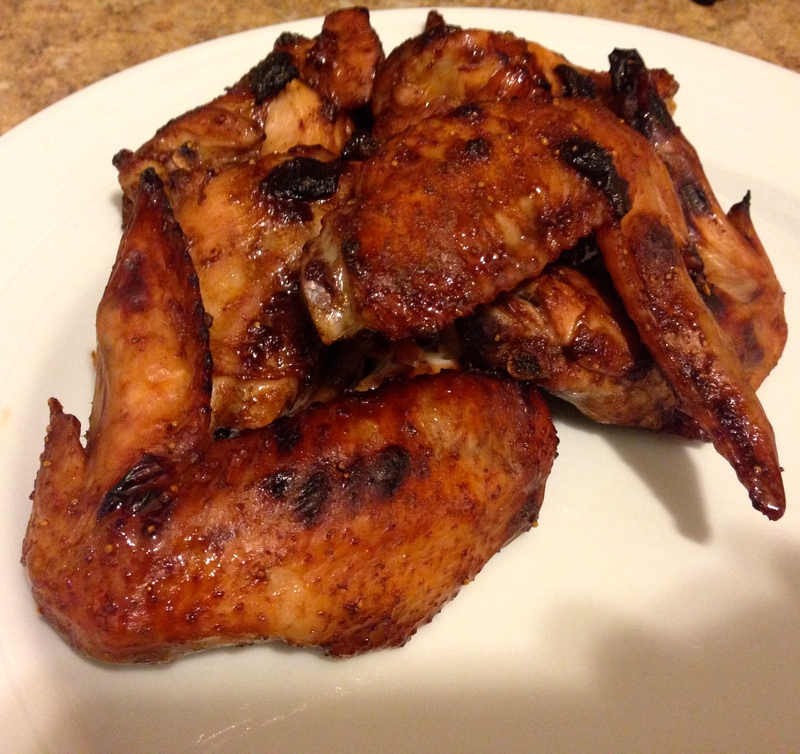 I was immediately drawn to Julie’s Balsamic-Lacquered Baked Wings. Wings have been a go-to weekly dinner lately. With a quick marinade and less than 30 minutes to bake–toss it with a simple salad and dinner is easy as pie. I switched up the ingredient ratio a bit, mostly from misreading of the measurements (oops…) but still a winner. Jammy with a great blend of sweet and sour. Preheat your oven to 450° F. Line a baking sheet with aluminum foil Fit with a wire rack and set aside. In a small to medium saucepot, combine the jam, vinegar, and soy sauce. Bring to a boil over medium-high heat. Lower the heat to a simmer and let it go a few minutes, until thick and glossy. Stir in salt, cayenne and garlic powder. Remove from heat. Place the wings in a large mixing bowl and pour the sauce over them. Quickly toss to coat thoroughly. 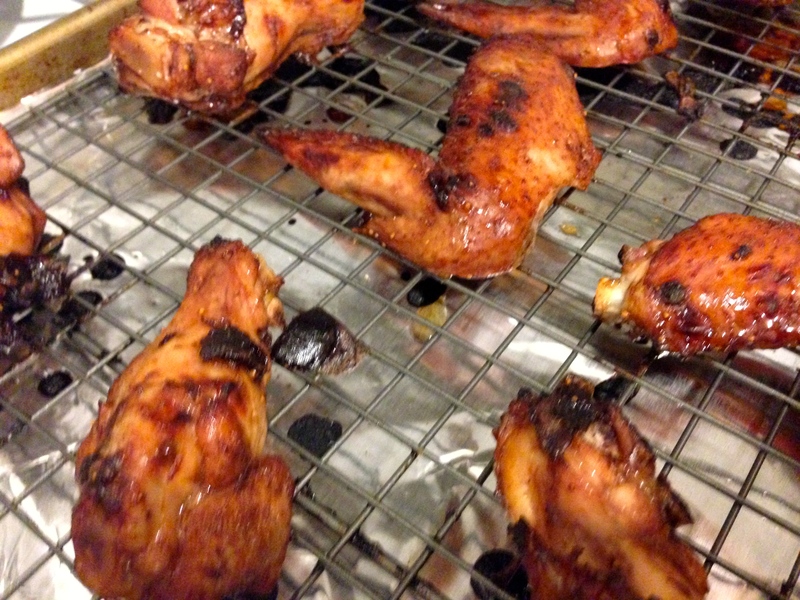 Place the wings on the baking sheet in a single layer, skin side up. Roast for 20 minutes. Serve immediately. Spring can be a bit unpredictable. Just last weekend it was 80 degrees in Brooklyn. Followed immediately by a blustery 50 degree day. The variability is actually one of my favorite parts of spring. It opens up a full spectrum of dishes to try. Some days it’s warm, and you feel like grilling. 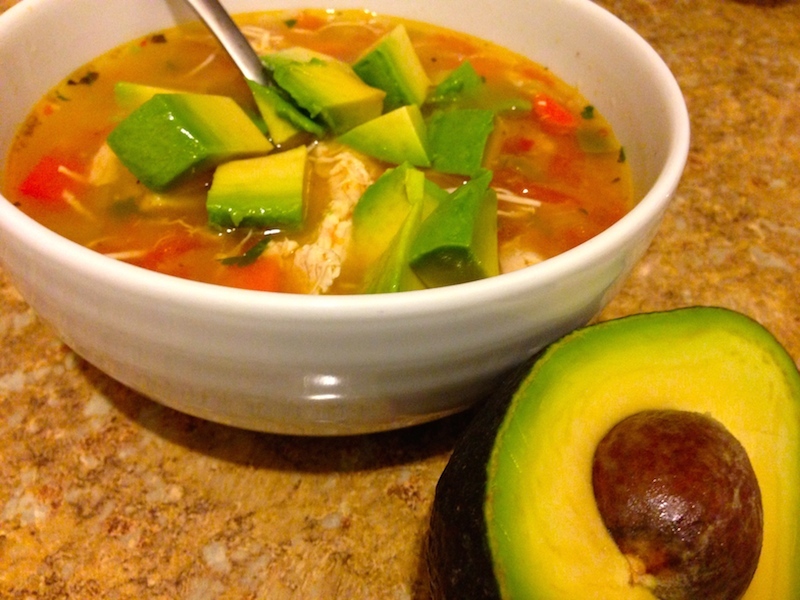 But on chillier evenings, you can still enjoy maybe your last bowl of soup until fall comes around. Last year for Easter, I felt the need to make lamb. It’s just so traditional. Considering I’m not a huge fan of lamb, it’s not something I cook often, with the exception of my at least once-a-month lamb with peas rotational dish. I wasn’t about to invest in a while rack of lamb. There’s nothing worse than splurging on a fancy cut of meat, only to mess it up. I did not want to risk an overcooked lamb dish. So instead, my mind shifted to stew. Like many braises, it’s a dish that can be cooked well in advance, letting you spend your evening with your guests, rather than holed up in the kitchen. 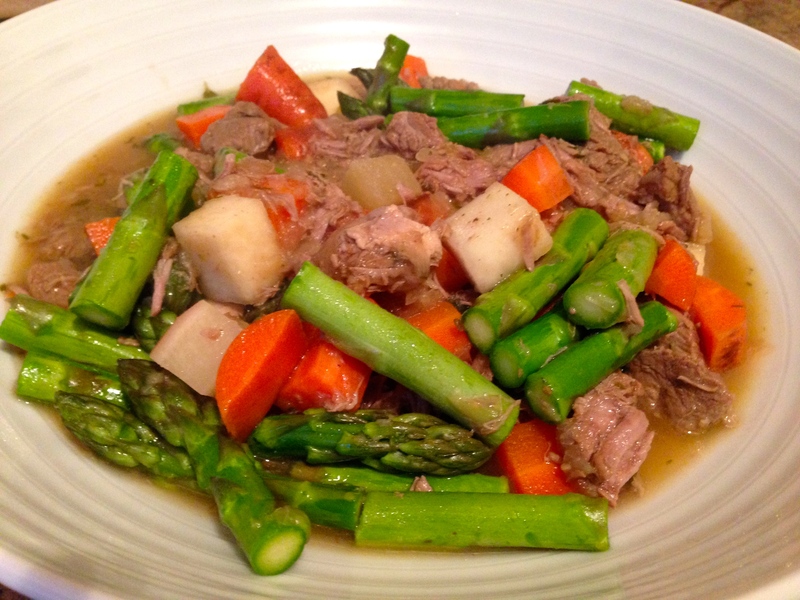 Slow stewed lamb, crisp asparagus, tender carrots and fresh herbs come together in this spring-on-a-plate dish. True when I made this dish, it was too early for local asparagus, so I had to fudge things a bit. But any day now, we should see those tender stalks shooting up at farm stands. A perfect mother’s day supper, me thinks. Melt butter in a large Dutch oven over medium-high heat. Add onion and garlic to pan and saute until soft, about 5 minutes. Spoon onion mixture into a large bowl. Add half the lamb to the pan and saute until browned. Remove from pan and add to the onion mixture. Add the remaining lamb to the pan, brown and add to onion mixture. Add wine to the pan, scrapping the pan to loosen the browned bits. Return lamb mixture to the pan and season with salt and pepper. Add half the herb mixture and bring to a boil. Cover, reduce heat and summer for 90 minutes, or until lamb is very tender. Add turnips and carrots. 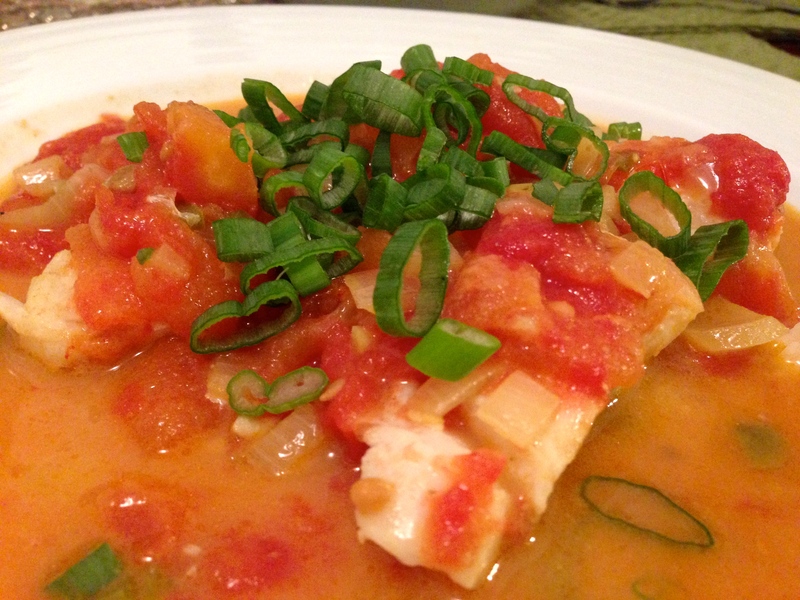 Continue to simmer, covered, for 40 minutes, until vegetables are tender. Add asparagus and cook until asparagus is bright green and tender, about 5 minutes. Stir in remaining herb mixture. Serve aside roasted new potatoes and plenty of bread to soak up the sauce. I’m still trying to figure out this cooking fish thing. But sometimes in my experimentation I stumble across something awesome. It all began with my Vanilla Saffron Imports. I tend to get sick pretty often. In our last apartment I experienced sinus infection after sinus infection. Literally one would end, I would be well for a week and the cycle would start up all over again. I blame it on the cleanliness of the building because after moving I felt much better. But still, it’s not unusual for me to get a cold, sinus infection or worse, bronchitis every month or so. My immune system has always been a bit tricky. When I went gluten-free, one of my biggest concerns was what to do when I got sick to make me feel better. Like clockwork for years, my feel better foods have been black tea with honey, toast with jam and most importantly–a couple of quarts of wonton soup. As soon as I felt the itch of a sore throat coming it became Chinese takeout night and my husband would order his favorites while I stocked up on wonton soup to get me through the next couple of days. I could live without the toast, but that warming soup? What would my gluten-free fix be? When I started my gluten-free adventure, I was mostly fearful of loosing two things–pasta and sourdough bread. I know I can make both on my own, I just haven’t had the time or courage to try yet. 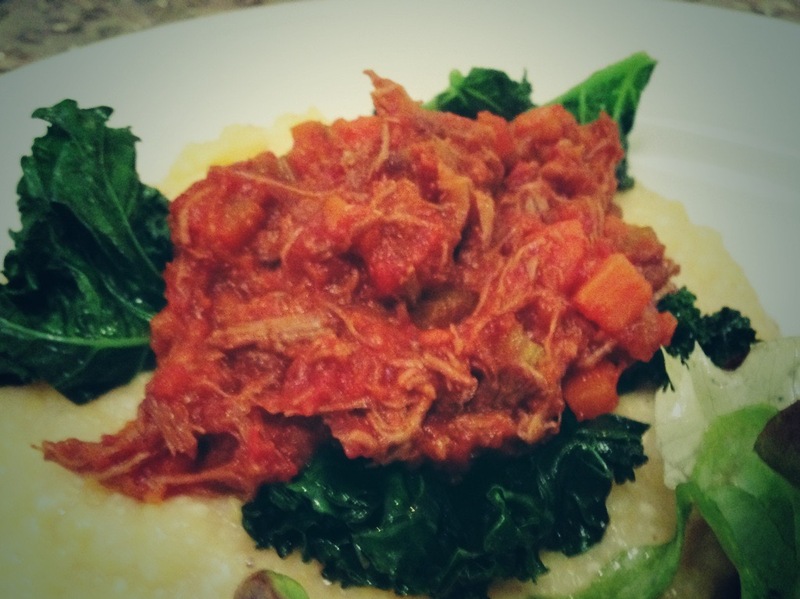 When I came across Brooklyn Supper’s Lamb Ragu over Polenta, I never thought it could fill that big pasta hole in my stomach, but the recipe looked so good, I had to at least try.